It’s almost that time of year again- time to sip icy cold rosemint herbal iced tea, snack on warm crawfish bread, and sway to the music of local and international musicians under the warm New Orleans sun. 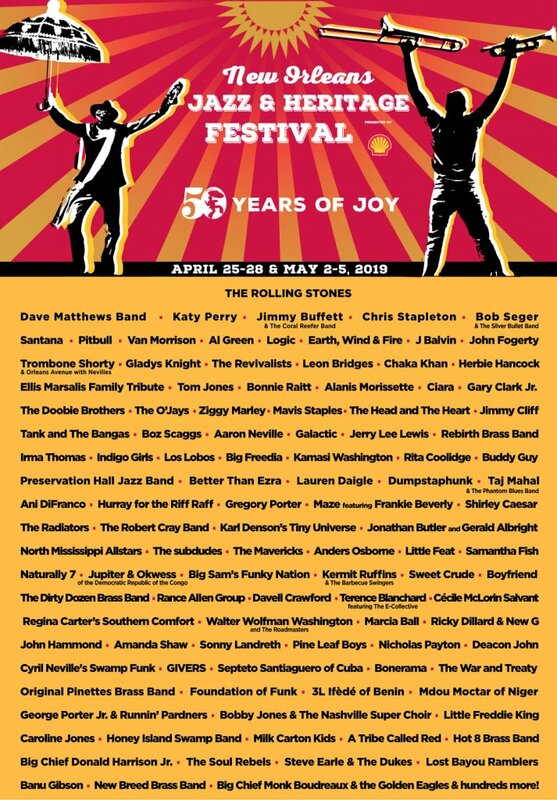 The New Orleans Jazz and Heritage Festival is one of the most celebrated festivals in New Orleans and takes place every year during the last weekend of April and first weekend in May. Jazz Fest has been around for fifty years and gets bigger and better every year. During these two weekends, locals and out-of-towners get together to enjoy the culture of New Orleans with the various food, crafts, performances that Jazz Fest has to offer. Contrary to the name, the New Orleans Jazz and Heritage Festival is more than just jazz music. Various musical genres like hip-hop, zydeco, blues, tribal, and electronic music can all be heard live coming from Jazz Fest’s multiple stages. This year the New Orleans Jazz and Heritage Festival will take place at its usual spot on the Fair Grounds Race Course on April 25-28 and May 2-5, 2019. View the complete 2019 Jazz Fest lineup below! To purchase tickets, visit nojazzfest.com.